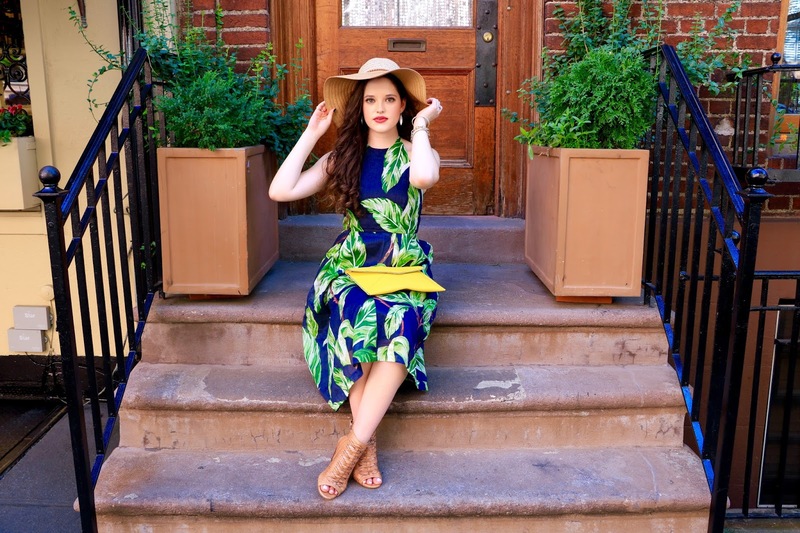 A dark, printed midi dress is the perfect transitional piece to effortlessly carry you from summer to fall. I can wear now with caged sandals and a sunhat, and later with a denim jacket and booties. 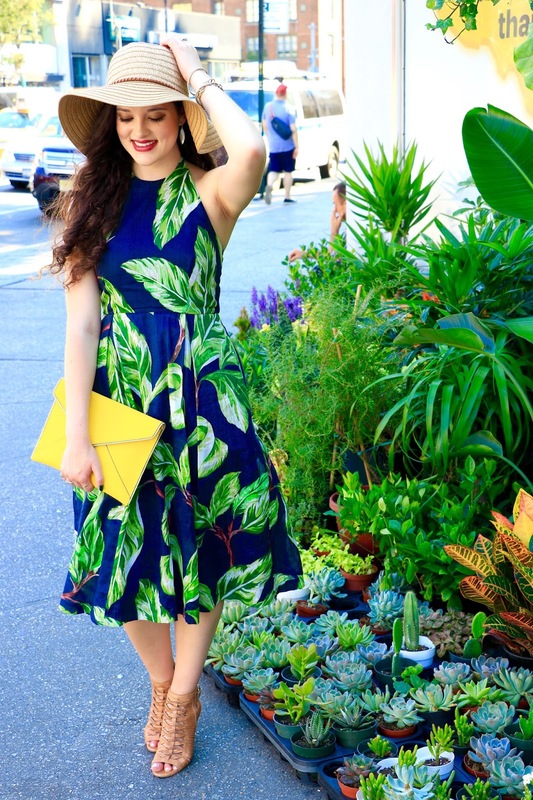 When I first spotted this dress in early summer, it was one of those "I have to have it" pieces. I love its ladylike silhouette, and don't even get me started on the beautiful colors - it looks like I'm wearing a painting! 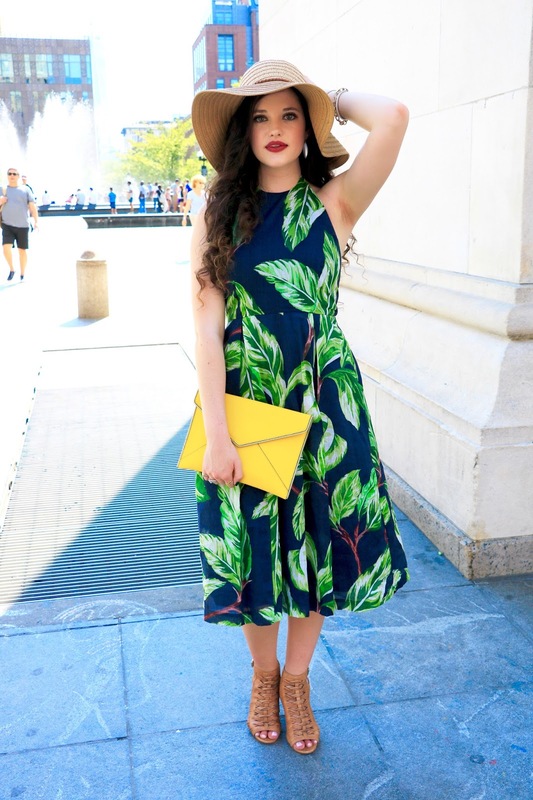 After all, leaf-print was super big this season and I definitely see this pattern continuing its popularity streak into fall. This is my very first floppy hat! I'm not a HUGE hat person, but in the past year or so I've seen the light. 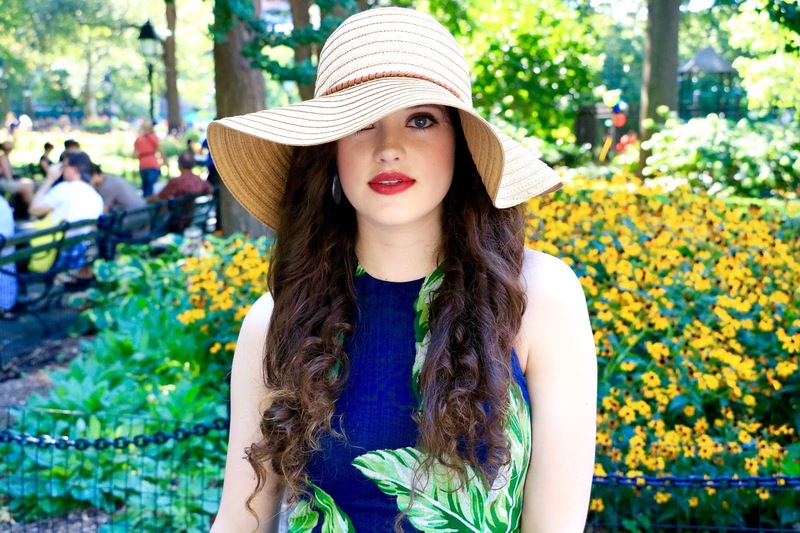 Hats truly are a great way to "top off" your look. 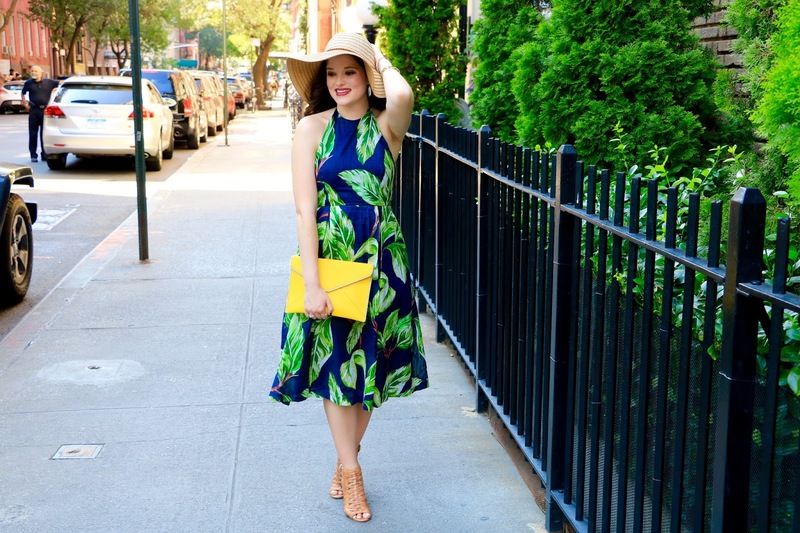 And this dress is what inspired me to purchase my first beachy hat, but it did take a while to find the right one. My boyfriend and I were on the hunt for this beauty all summer long, and when we finally found it at Bloomingdales, he surprised me by buying it for me. I love that he gets just as excited about finding the perfect hat as I do! I call these heels, sandals, but technically they can also be categorized as "booties," which makes them the perfect shoe for - you guessed it - transitional weather. And their earth-tone hue pairs well with absolutely anything - even an LBD for a casual night out. I can't get enough of carrying this clutch around. It seriously looks amazing with so many different outfits. 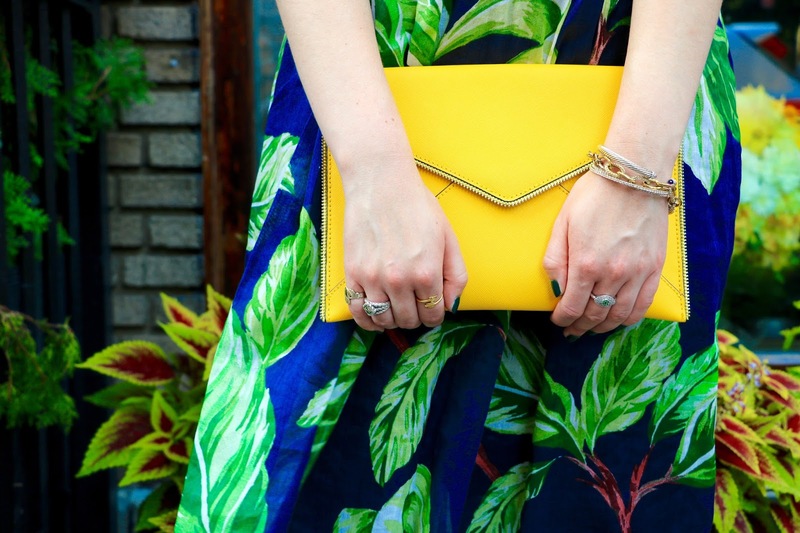 I've found that there's nothing a bright yellow clutch doesn't compliment. 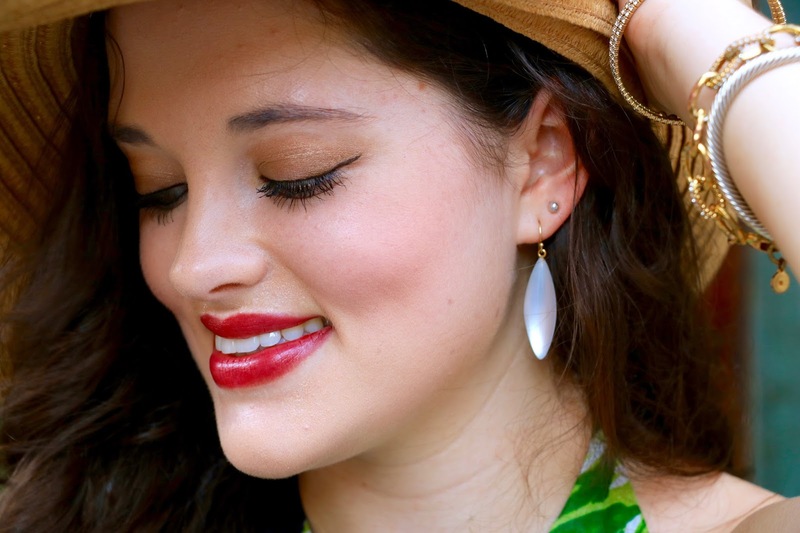 These statement earrings are so fun to wear! They truly stand out, especially against dark hair, and the best part is that they're super lightweight. I also love how they give off a sophisticated boho vibe. Even better, they're available in black and silver as well as white. A red lip added the perfect punch to this bold look. I just love how red, blue, and yellow look together. 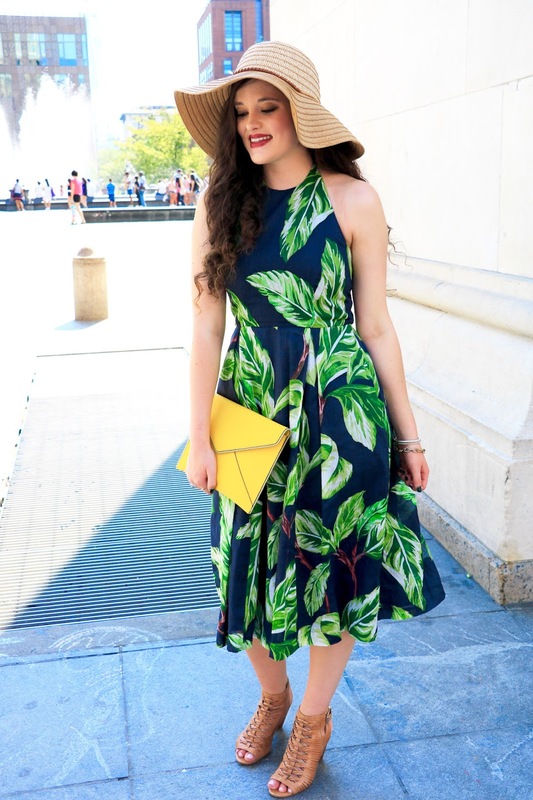 This is late summer's perfect formula: muted-tone midi dress + floppy hat + open-toed sandal booties + bright clutch. 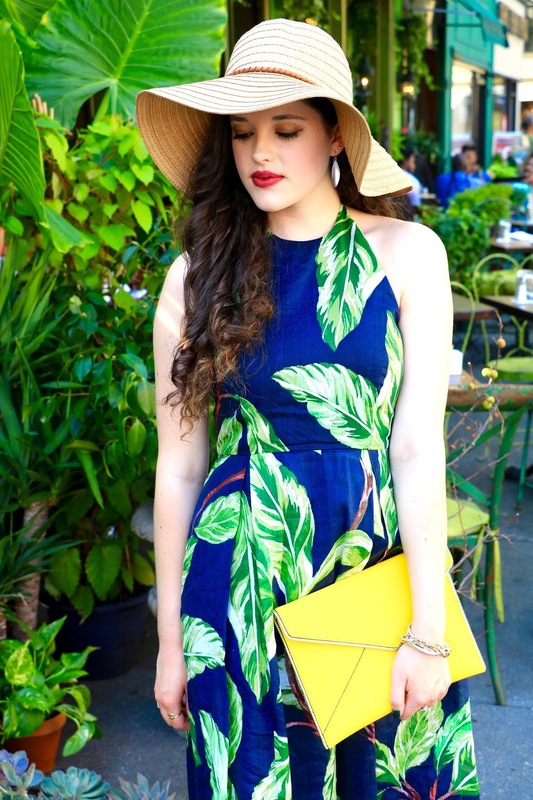 These photos were taken on the Lower Westside of Manhattan after I enjoyed a belated birthday brunch with my friends. It was so fun wandering around this part of the city afterwards and shooting with my boyfriend, Antonio. Since Antonio started taking my photos, we've become urban explorers together, scouting out the perfect spots to capture specific looks. 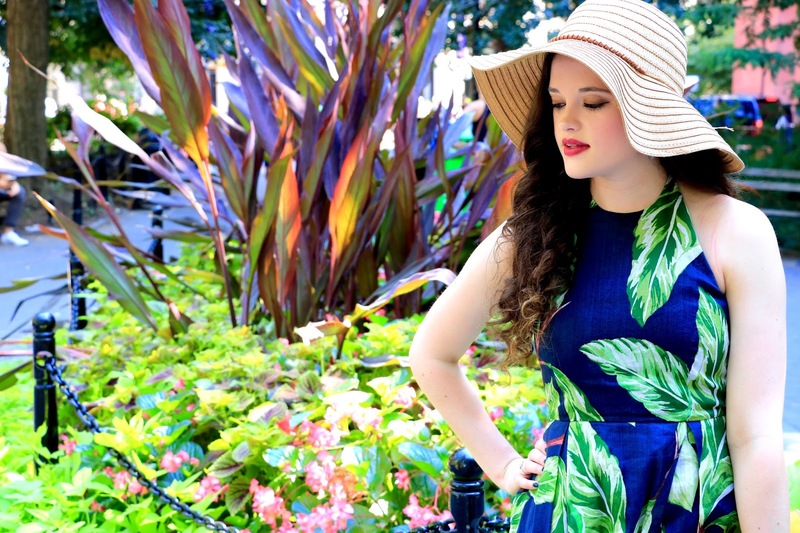 I love how my dress blends into the foliage in some of these shots. This dress is gorgeous! I also love the sandals/ booties so cute! You look gorgoeus in this dress Kat! 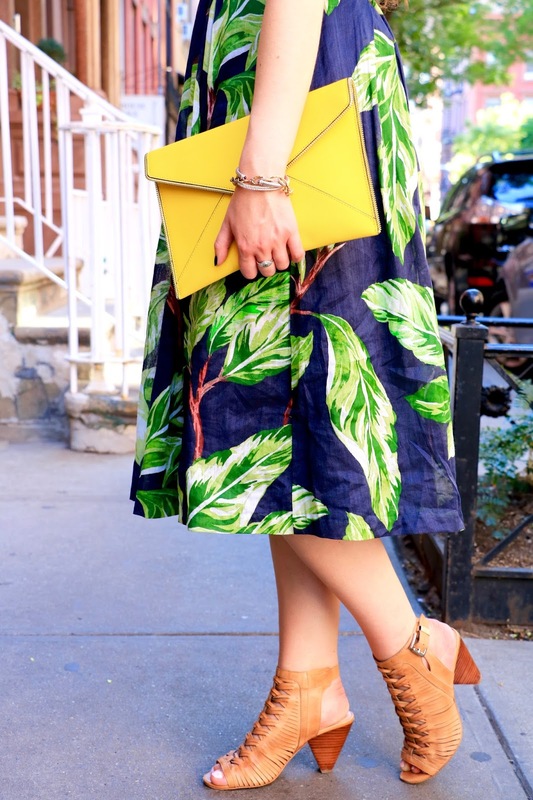 Love the pop of yellow too. 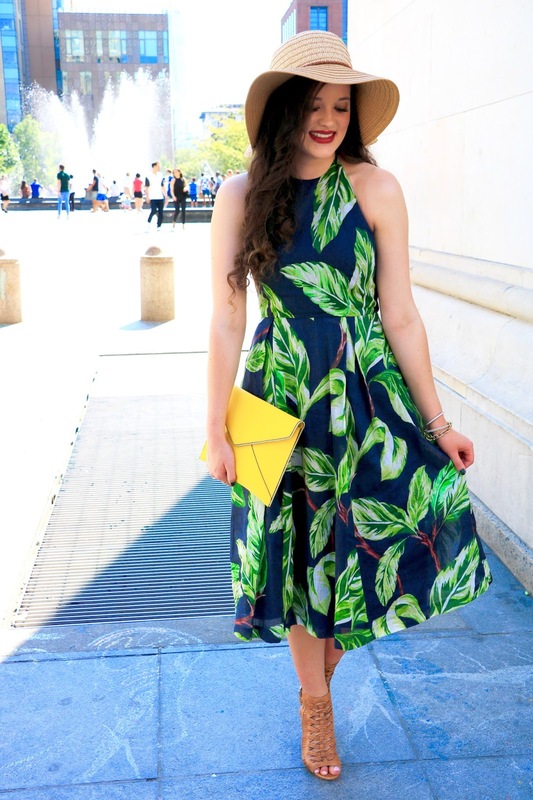 Stunning Kathleen, love the print alot. 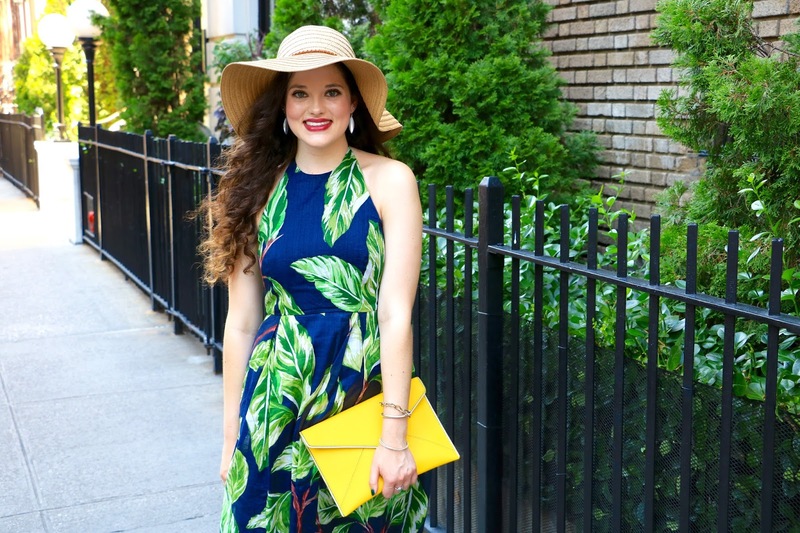 Plus, I really like the accessories you chose - that neon yellow clutch is the coolest! I love this dress! 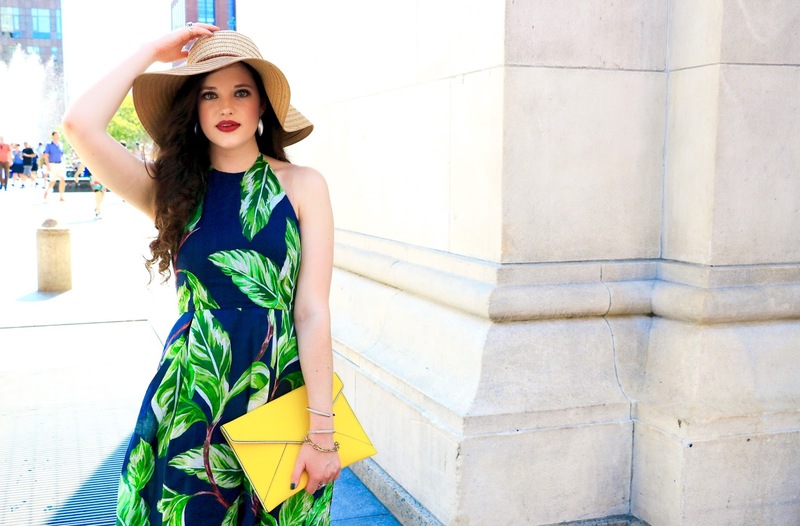 It is so stunning on you! The cut is perfect. I also like how you accessorised it! 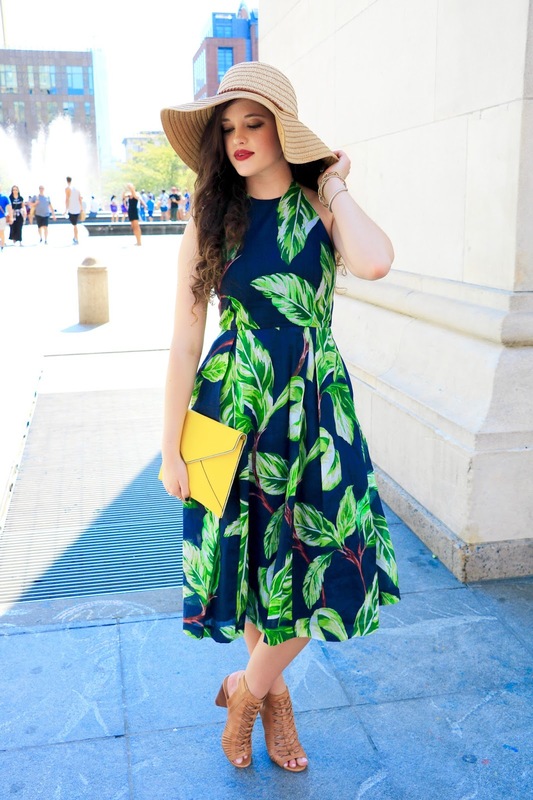 Your dress is gorgeous, I really love how you styled this outfit your hat and sandals goes perfectly with the dress. 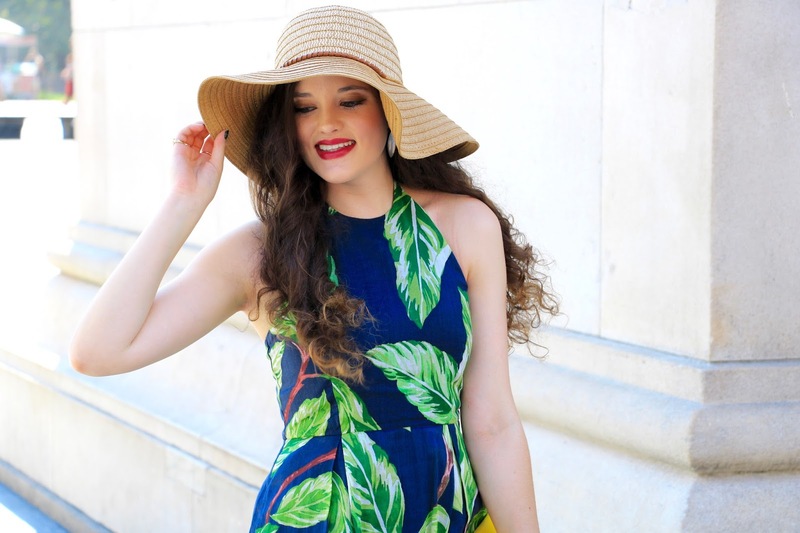 The printi of the dress is beautiful, this colors suit perfect with you and the hat give a nice touch! Beautiful dress to transition with, I also think that caged heels are a good transitional piece!